The architecture lives placidly in the area of the orthodoxy, bendecida for the rules commonly accepted by the group, freely of mistakes or faults. The codes justify, the cánones legitimize. Though not always. The history has given us magnificent examples of architecture arisen from what Enrique Walker qualifies as “the ordinary thing” 1, that is to say, the daily thing, the popular thing, the banal thing up to the limit of the incorrectness. Architecture exercised from the alteration of the canon. Alyssum and Peter Smithson finish in 1954 his austere one and miesiana Hunstanton‘s secondary school, Norfolk (United Kingdom), considered the manifest of the new brutalismo. Only one year later they approach a small domestic project in Wattford: the house for the engineer of structures Derek Sugden2. His exterior aspect resigns any presumption of singularity and joins with nonchalance the anonymous fabric of the suburban house, exercises with sloping cover and front of brick I dress for a middle class of lounge, kitchen and four bedrooms3. Nevertheless the architecture deals neither on materials, programs, scales nor orthodoxies and turns out to be always unexpected. The reading commits an outrage of plants and sections shows complex mechanisms of to live; the photografhies of the interior space reveals a radical and refreshing modernity, a contemporaneousness developed from the honesty of the commonness, without the deliberate intervention of the architecture. The incorrectness can be a powerful tool of transformation. They tell that Pío Baroja, thanks to the use of certain incorrectnesses of the language, was “the initiator most distinguished from the linguistic revolution in Spain” 4. In this case, since in that of the Smithson, the mere provocation, the surprise excels itself or simply the farce: the major incorrectness is to be one itself; the incorrectness supposes the alteridad of the system and from his rigorous knowledge, proposes his availability to be different; the incorrectness supposes the abuse, the abandon of the caution disciplining, going out of the cave and exploring the sunny suburbs of the architecture. 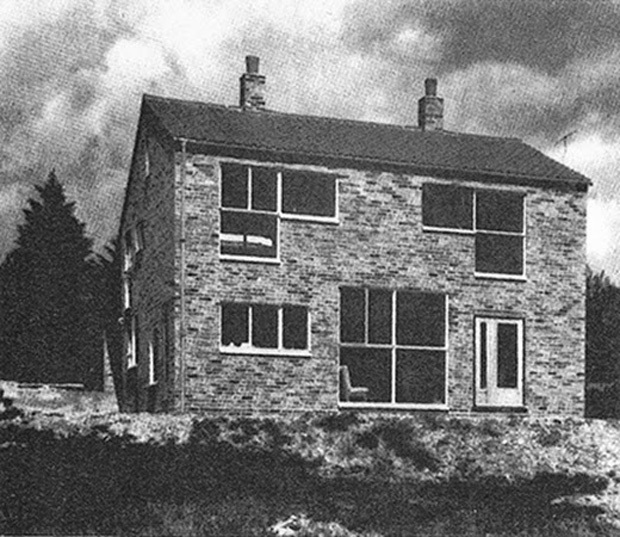 2 Sugden House, Wattford, United Kingdom 1955. 3 The client rejected the more orthodox first offer, we would say of “architecture”, which apparently annoyed exceedingly Alison Smithson. Sugden’s statement Alison y Peter Smithson – from the House of the Future to the house of today, edited by Dirk van der Heuvel and Max Risselada, Rotterdam, 010 Publishers, 2004.